How to stop worrying and form a deathstar around Overwatch's new tank. 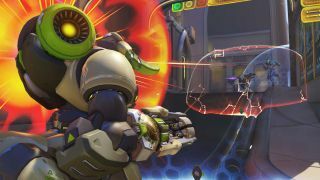 Whether you’re planning on how to avoid SR decay or trying to be the first Orisa specialist, Overwatch’s new tank is hitting the competitive ladder this week. Transitional periods around new characters are always fun, but they can also be difficult and challenging for a variety of reasons. Don’t get discouraged by toxic teammates! I caught up with some professional Overwatch players to see what their thoughts were on Orisa so you can take your game to the next level. Other than a new set of mechanics to master, learning how a new character functions in a team is one of the most fun and rewarding experiences in the game. Considering Orisa’s skillset, that function may not be immediately obvious. Is she a main tank, an off-tank or a bit of both? A couple things on this one. First of all, look at the positioning by Immortals. It’s essentially split into two groups, each with a tank, healer and DPS. The mobile team stays up top while Orisa, 76 and Zen shift to the bottom. Excellent use of space and teamwork. Next, how about that Supercharger placement? Hyped drops a shield on one side of it and fortifies himself on the opposite side, giving a lot more longevity to her otherwise flimsy ultimate. Voll and Super are unsuccessful in destroying it, eventually falling to a Tactical Visor by GrimReality. Take note of the skill timers there. Fortify following a delay after the shield goes down, and you have a lot of mitigation with little downtime, if any. Now think about that in terms of team synergy, particularly having a pocket Ana. That’s a scary thought indeed. That’s something I hadn’t considered when thinking of how Orisa could put up some offensive assists. When thinking of the mini graviton (never “Halt!”) the two things that come to mind are environmental kills and spam situations where heroes like 76 and Pharah are suppressing an area. But by helping Symmetra who already builds ult pretty fast, Sym-friendly maps like Anubis and Hollywood can get fortified that much faster, leading to holds against some of the brutal dive compositions that are so prevalent right now. There’s also the shielding to consider. Orisa, Rein and Sym can put out a ton of mitigation for their team and lock down choke points with ease. Theorycrafting a bit further, if you toss 76 into the mix, you can help your healer(s) keep that fortified tank line up with a healthy dose of off-healing. Orisa is packing a lot of useful tools in her arsenal, there’s no doubt about it. She has intrigued the Overwatch community since her days in the PTR, and Overwatch pros have taken a quick liking to her too. Though the meta is going to need quite a bit of time in the oven before we can say whether or not a definitive shift is in order, it’s great seeing a team like Immortals show the world what some creativity can do. If there are any shortcomings in Orisa’s game, it’s that she has trouble “peeling the dive”, as they say. Mobile characters can run circles around her, which you will probably see a lot of on the ladder. In any case, have fun out there and thicken up that skin if you’re planning on bringing Orisa out for a match or two this week.